Written and Directed by Jaco Van Dormael. 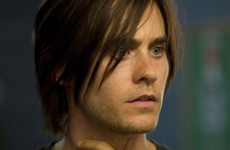 Mr. Nobody is a story that spans the multiple timelines that arise as a cause of the choices in our lives. Here we see a boy at the age of 9 given the choice to decide who he wants to live with, his Mother or Father. Of course, both parents love him as much as he loves them, so which is the right choice? This film had it's original world premiere at the 66th Venice International Film Festival on September 12, 2009. 4 years later and it'll finally be released in the U.S. in select theaters November 1, 2013. You can also find it at Amazon.